I love the sour taste of Sorrel. Its great raw in mixed green salads or as the main ingredient in the French classic, Sorrel Soup or the Eastern European classic, Schav. Sorrel is a perennial in the Polygonaceae family along with such relatives as buckwheat and rhubarb. The reason I mention it now is that after 3 seasons ours has just bolted. Kohlrabi was harvested recently and like other uncommon vegetables the question most asked was, what do we do with it? First, a little information; Kohlrabi is a member of the cabbage family. Its name is derived from the German Kohl (cabbage) and Rube or Rabi (turnip) because the swollen stem looks like a turnip. The taste and texture of kohlrabi is similar to broccoli stems or cabbage hearts but milder and sweeter. It can be eaten raw or cooked. Small kohlrabi do not need to be skinned, but the larger ones definitely do. Of kohlrabi’s two varieties the purple globe is sweeter and tastier than the apple-green. Nutritionally, kohlarabi is very low in Saturated Fat and Cholesterol. 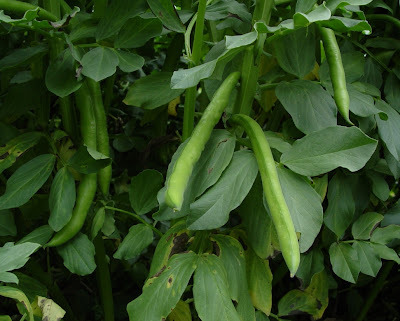 It is also a good source of Thiamin, Folate, Magnesium and Phosphorus, and a very good source of Dietary Fiber, Vitamin C, Vitamin B6, Potassium, Copper and Manganese. See complete Kohlrabi Nutritional Values from nutritiondata.com. Its not quite fair that summer harvest begins at the close of school. We got our first cherry tomatoes a week before school ended, but no heirlooms, no corn either. 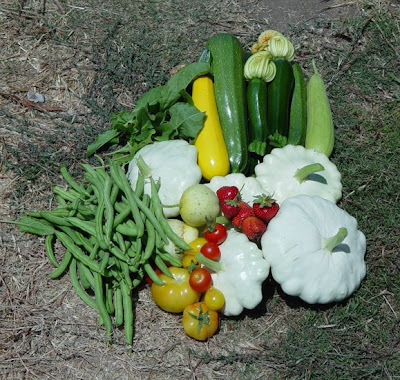 Fortunately some of our school gardens are accessible year round and currently zucchini and squash are plentiful. Try these zucchini/pasta recipes for those who like their pasta both healthy and flavorful. Enjoy! Boil water and cook pasta (use whatever kind you like: fusilli, penne, linguini, whatever). Sauté sliced zucchini with garlic, onions and basil in olive oil until softened. Place in Cuisinart and pulse until chunky. Salt and pepper to taste. Mix with cooked pasta and top with grated Parmigiano or Pecorino cheese. Sauté sliced zucchini with garlic, olive oil, hot red pepper flakes, and fresh mint. Place in Cuisinart and pulse until chunky. Salt and pepper to taste. Toss with cooked pasta. Top with grated Parmigiano or Pecorino cheese. We’re harvesting cabbage, we’re harvesting carrots, put them both together what have you got? That’s right, we’re making cole slaw, a name derived from the Dutch word koolsla (kool) cabbage (sla) salad and made famous by a guy named Richard Hellman, a New York City deli owner who made salads and sandwiches with his wife Nina’s home-made mayonnaise. Once Hellman started bottling the mayonnaise in 1912, cole slaw took off as a national side dish. For those of us on the west coast we know Hellman’s mayonnaise as Best, it is one and the same and the one by which all others are judged. To make our cole slaw I’ve got a cutting board, a kitchen knife, a vegetable peeler, a carrot grater, and a big mixing bowl. First lets harvest our veggies. 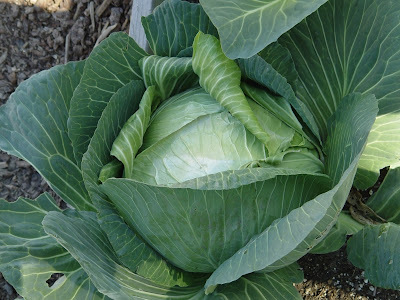 When picking cabbage pull the whole plant from the ground, snip off the base (stem and roots) and cut away the big tough outer leaves till your left with a tight round head. With the carrots (4 small ones) cut away the green tops. Wash both under running water. Cut the cabbage into quarters and then into thin, fine strips. Peel the carrots, grate, and add to the cabbage. Next, we make our dressing. Add three tablespoons mayonnaise, 1 tablespoon white vinegar, sprinkle of sugar, dash of salt & pepper and mix well. Enjoy! Swiss chard is having an identity crisis. Not as popular as carrots or as tasty as tomatoes, this prolific relative of spinach is in need of a good publicist. 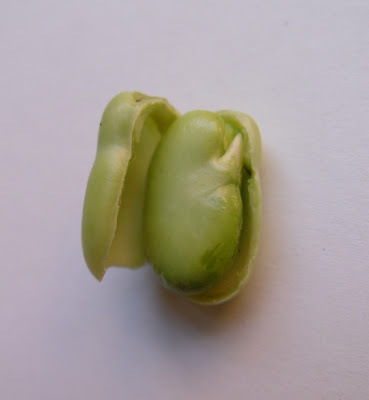 Being a biennial it will take two years to complete its lifecycle and go to seed. To the school gardener and the home gardener this means greater reward for your labor. 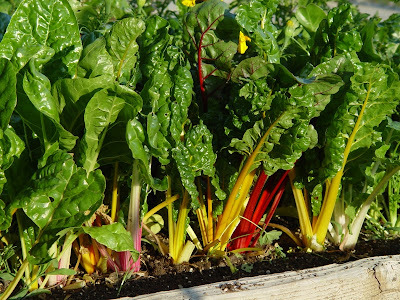 With minimal effort one can be picking Swiss chard 52 weeks a year in our mild winter climate. 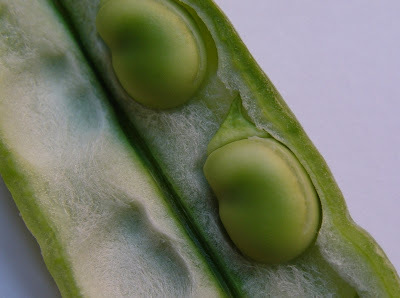 Just pick the outer leaves and leave the smaller inner ones intact. This lovely rainbow variety does cause heads to turn and students clamor to take a few cuttings home simply because “it looks pretty”, however, the one question I get from everyone, including teachers is, what do you do with it? My simple answer is, its in the same family as spinach, any recipe calling for cooked spinach can be substituted with the green leaves of Swiss chard, the stems are another story and we’ll get to that in a second. Below you will find two recipes for Swiss chard, the first is for the leaves, the second, for the stems. In boiling salted water cook ½ lb pasta for 10 minutes, drain in colander. In same pot sauté ½ cup onion and 2 cloves garlic in 2 TB olive oil. Add one chopped turkey sausage and cook till browned. Add two bunches chopped Swiss Chard (about 3-4 cups) and sauté till wilted, adding up to ½ cup of broth (chicken or vegetable) as needed, about 10-15 minutes. Add cooked pasta, salt and pepper to taste and sprinkle with Parmesan cheese before serving. Chop stems from two bunches of Swiss chard (approximately 2-3 cups) and sauté with one onion and two cloves of garlic in 2 TB olive oil. Add a little chicken broth, vegetable broth or water, about ¼ cup, and cook till softened, about 10-15 minutes. Pour off liquid then stir in 3-4 tablespoons of tahini (start with 3 then add more as needed), juice of one lemon, two tablespoons olive oil, pinch of garlic salt, pinch of cumin, salt and pepper to taste.